The BFST® and ColdCure® Leg Wraps are designed to treat Shin Splints, Hamstring Injuries, Quad Injuries, Calf Strains, IT Band Syndrome and PCL Injuries. This means they can be applied to your calf, shin, thigh or the back of your knee. These two devices together are just what you need to quickly relieve the pain and heal your leg injury. 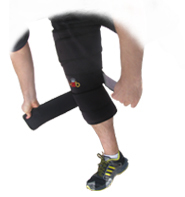 The Leg Wraps are incredibly versatile and can actually be used to treat other areas of your body, such as the bicep, forearm, neck and the back (for smaller people and/or children). They're awsome!! I love my wraps so much! I've only been using it a week, but my knee already feels stronger. I play for a men's hockey league and will be recommending it to the others who have knee pain. For superior coverage of your Leg injury or condition, use our ColdCure® and BFST® Large Body Wraps. They have a massive treatment area of 16"x16". These Wraps almost envelop your entire leg all at once. They're a great alternative for people who find that other leg products just aren't big enough. The Large Body Wraps are extremely versatile because they're designed to be used on many different areas of your body, not just your legs. You can use them on your back, arms, abdomen, neck, shoulders, etc. I am more optimistic now with this treatment than I have been for the last 6 months since my injury. I think it's a great treatment and already notice my hamstring to feel better after each one. KB Support Tape provides your tissue with additional support and protection. Use it between your BFST® or ColdCure® treatments for ongoing compression throughout the day. KB Support Tape also helps to prevent re-injury, which is especially important during physical activity. You can wear it during all of your daily activities without it getting in the way or restricting your range of motion. KB Support Tape comes in 2 different sizes: 2 inch wide and 3 inch wide. We recommend the 3 inch wide Tape for Leg injuries, because it provides maximum coverage for all areas of the leg. The 3 inch wide Tape comes in both Black and Beige. There is no functional difference between the colors, they just allow you to express your personal style. The above image shows an example of a tape application for a Hamstring Injury. We encourage you to look into various applications for your leg injury to find the one that works best for you. 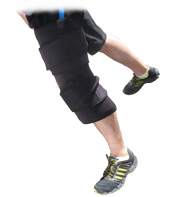 Applications will differ depending on the area of your leg that's injured and what type of leg injury it is. There are plenty of examples online. Everyone wonders when they order on line what the quality of the product they receive will be. I can personally attest to the high quality of King Brand's products. I have purchase five of their products and all of them exceeded my expectations in quality, performance and results. If you are using a drugstore heating pad to treat an injury, I can tell you that you will be amazed at how much more even, controlled and deep the heating from these wraps is. The gel packs are like nothing I've ever seen. They are sturdy, the get is uniform thickness, it stays that way and they stay cold for much longer than the 20 minutes you will use them. They freeze quickly and they are so much better than gel packs you can buy over the counter. My left knee is bone to bone on the anterior side. After using the knee wraps for two weeks now, I have less pain than I have had for the last 2.5 years. I am back on the golf course, too. It's clear to me that the improved blood circulation to the surrounding tissue is helping me. I could not be happier with these products. Every BFST® and ColdCure® Wrap purchase comes with the additional benefit of having one of our helpful King Brand® Advisors contact you 4 or 5 days after your order has been delivered. This is to ensure you have received your order, find out how your treatments are going, and answer any questions you may have. Our Advisors have been thoroughly trained on BFST® and ColdCure® technology and treatments. They are also highly knowledgeable when it comes to treating leg injuries and conditions. Our Advisors spend all day every day giving people treatment advice and guidance. They truly care about your recovery. While one of our Advisors will follow-up with you directly, you are welcome to contact us if you need any assistance. We're here for you through every stage of your recovery. King Brand® BFST® and ColdCure® Wraps are FDA Registered medical devices. They have also passed the Health Canada, ISO 13485, ISO 10993 and IEC 60601-1 3rd Edition approval processes. ISO 10993 is very important in terms of material safety. This regulation ensures that our devices are made from materials that are safer than those used to manufacture most baby products. Part of being an FDA Registered company means that our products are made from high quality, biocompatible materials. These devices are manufactured and tested to the highest safety standards in the industry. Note from KB WebMaster - The text below is primarily intended to assist with Google properly classifying this page content. To learn more about our products please visit our website.<br>Leg injuries and conditions include shin splints, posterior cruciate ligament injuries, iliotibial band syndrome, leg sprains and strains, leg tendonitis and leg bursitis. Leg injuries plague many people. A bad leg injury causes leg pain. 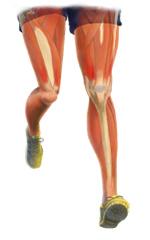 There are many symptoms of leg pain caused by leg injuries. Treatment for a leg injury will cause your leg pain to improve and your leg injury to heal. There's no doubt that to heal leg injuries quickly you need BFST treatments. ColdCure will help with leg pain. You can cure leg pain and a leg injury with BFST and ColdCure technology. So, if you want to heal your injured leg quickly, you need BFST. If you want to treat leg pain you need ColdCure. Leg injury symptoms are leg pain and swelling. A sore leg can be helped with leg exercises although leg exercises won't cure all leg injuries. Some leg injuries require surgery. This heals the injured leg but the pain in your leg after surgery can be severe. The best leg injury treatment is BFST. The best leg pain treatment is ColdCure. These wraps are incredible. They feel comfortable. They work.